Creating new products, designing new machines, manufacturing new materials…. these are all common examples of what we typically think of when we hear the term ‘intellectual property’. However, what many fail to realize is that ‘intellectual property’ can actually be used to cover practically any form of unique creation, including software that has been developed either for the business or for a client. Patent applications for software have been growing at an almost unprecedented rate. In the United States alone, the US Patent and Trademark Office reports that an average 289 patents were granted for software per year prior to 1995; a figure which now stands at around 2084 per year. 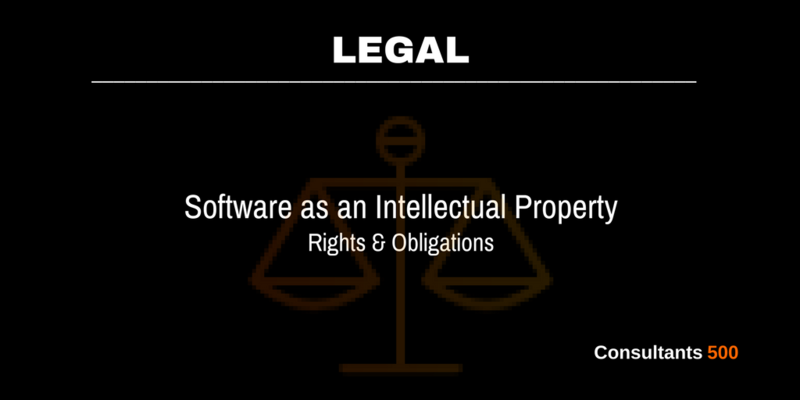 Therefore, it is essential for developers, engineers, and software businesses to fully understand not only their rights regarding software as an intellectual property but also the IP obligations that they have, too. A patent can be used to protect any factually-based aspect of the software. This could be, for example, the underlying algorithms upon which the software is based. However, a patent is not granted automatically, and businesses will need to apply to the Patent Office in order to protect their software. A copyright can be used to protect any creatively-based aspects of the software; anything that stems from a developer’s own creative ideas and concepts. The most obvious example, of course, is the source code itself. Copyrights are, in most instances, automatically applied to the software upon completion. A trademark is slightly different to patents and copyrights in that while it fails to protect the creative ideas or algorithms, it instead works to protect the software’s name or any symbols which have been used in place of a name. Like patents, businesses are required to request and apply for any trademarks. Intellectual property in any sense is highly important. Not only can it work to boost brand awareness, but it is also considered to be one of the most attractive draws for potential investors. Of course, it’s also a way of protecting what is rightfully yours. Unfortunately, software can be highly vulnerable. Internally, there are concerns of theft from employees or contractors, while in terms of tailored software created specifically to client request, there are concerns that source code could be used without payment. While the first stage of software protection looked at legal protection of the source code and associated concepts, the second stage focuses on the business obligation to protect the registered intellectual property. It is not enough to simply apply for patents or trademarks; businesses need to ensure that they are taking the appropriate measures to protect their property and minimize the risk of theft or other losses. Software escrow is a way of protecting IP rights when developing software for a client. By maintaining data with a third party (such as a software agent), both code and rights can be held in escrow until an agreed event (bankruptcy, for example), with the relevant party able to access their rightful property. For internal software, HR agreements are most commonly used. These agreements will vary depending upon each business’ individual situation, although access restriction, non-disclosure agreements, and clauses relating to a business’ ownership of employee ideas and/or products tend to be frequently used. Interestingly, as the software world is evolving, the idea of software as an intellectual property is also changing. With the rise in Agile development, for example, comes the need for alternative forms of protection. Agile has many characteristic traits which mean that traditional forms of property protection may not always prove to be the most suitable option. Agile’s rapid nature leaves little time for thorough evaluation of the software in its various stages to determine the necessity of protection, while the multi-input technique also means there are typically large numbers of developers all focusing on a small subsection of the project. This can make it difficult to identify the point at which IP should be considered. It is anticipated that, in the future, there will be increased use of ‘feedback clauses’ which stipulate that ownership of any client feedback utilized throughout the project will be transferred to the business, of prior personal agreements with regard to ownership, and of ‘Trade Secret’ protection which will act as a placeholder for protection until such a time that proper evaluation for patent can be completed. Businesses keen to protect their software are advised to work with an experienced corporate attorney who can suggest the best methods of protection while also providing greater detail regarding a business’ rights and obligations when holding source code, ideas, and software as an intellectual property.